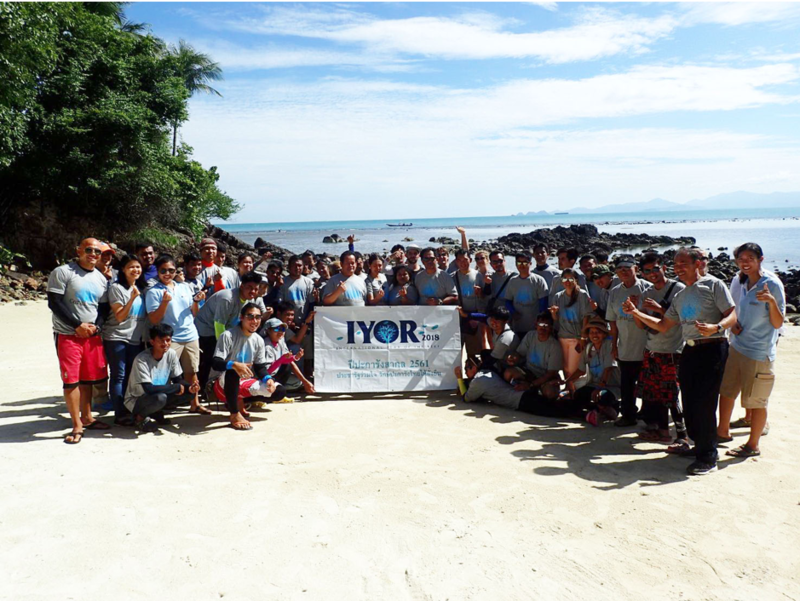 To celebrate the International Year of the Reef 2018, on 14th June 2018, Department of Marine and Coastal Resources, Thailand held a coral restoration activity at Thong-plu Beach. The event was in cooperation with the local community, hotel and tourism sectors and local governmental administration organisation at Samui Island, southern Thailand, about 76 people joined the event. Samui Island is one of the most famous destinations in the Gulf of Thailand for enjoying the sea, including snorkeling and diving. Shallow coral reefs became deteriorated due to careless activities, such as anchoring and stepping on corals by tourists. Broken coral fragments are found on the reefs due to such activities as well as the monsoon waves. In addition, we found many young corals growing on loose or dead coral fragments on the intertidal, shallow rubble zone. Such an unstable foundation for living coral fragments or young corals, means they are less likely to survive as they can be easily buried by sand or constantly moved by waves and surge. The coral fragments can be given a better opportunity for survival by being firmly attached to the reef substrata. We used epoxy glue or a strong cable tie which works very well. From previous experience we expect that the coral fragments will settle and begin growing once again within a few weeks. In this event at Samui Island, about 3,000 broken living coral fragments and young corals were collected and transplanted (firmly attached) on the reef at the more suitable zone!